A CONSTANT advice expecting or new mothers receive is to drink milk. It is assumed that the amount of milk taken in will equal the amount of milk produced. It makes me wonder why we never scrutinise a cow’s dietary patterns. If we did, I reckon milk is nowhere on the list. So, a mother is not required to guzzle down milk. Research and numerous studies have proven that mothers who do not have access to nutritional food are equally capable of producing nutrient and antibody-rich breast milk, albeit undergoing erosion of nutrient reserves from their body that later sets them up for issues such as osteoporosis. Lactation is primarily governed by the secretion of two hormones—prolactin (milk making) and oxytocin (milk ejecting). As soon as the placenta exits the mother's body and every time your baby drains a breast significantly, the brain calls for more milk to be made. Successful nursing, which includes milk production, ejection and draining, depends on a mother’s intention to nurse and the support she receives, a good latch (a baby’s grip over the mother’s areola determined by proper nursing positions), regular and on demand feeds and giving baby enough time at each breast. It is interesting to note that human breast milk has only 0.2 per cent calcium. Water, proteins, lipids, carbs, minerals and other bioactive ingredients make up the rest. Then why do people (including doctors) insist on increasing calcium intake? It is because this mineral is crucial for the growth of your baby’s skeletal structure and reducing risk of pre-term births and maternal deaths. Its intake must also continue while nursing to avoid its depletion from your own reserves. 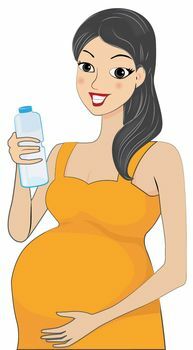 The recommended dietary allowance for calcium stands at 1,000mg for pregnant, non-pregnant and lactating women between the ages of 19 to 50. Yes, that is how crucial calcium is in a woman’s diet. Since this high dose may not be met by diet alone every day, calcium supplementation (up to 500mg) is often prescribed by doctors to women. In everyday diet, this mineral can be sourced from dairy products, leafy vegetables, beans (channa, lobia), fortified cereal, bread and juice. * Over a 24-hour period, the average intake of milk by a breastfed baby is 750-800ml. * A report by the United Nation’s Food and Agriculture Organization claimed that the lactating breast requires a higher proportion of resting energy than the human brain!